"[UncorrectedPersonalityTraitColleague] has obtained a job which more closely meets his skills and aspirations and will be leaving us. LineManager". Blimey. I turn my back for five minutes and look what happens. I wonder if there'll be a leaving do? That's it. I'm on holiday now. Yes, I am exited. No, I still haven't made enough lists. When I said I'd packed I was lying to keep LovelyTeamMember happy. And if there is a power struggle in my absence, my money is on Charlie. But that wasn't really what I was going to say at all. I had this great title and then some stuff that would've been almost relevant to it. Somewhere between the typing fingers and the brain there was an edit. Possibly because I came up with the ideas last night while under the influence of truth serum. Anyway. The BarLad at The Railway has some really good cd's. If you give him a break by not putting Nena on the jukebox you can have Jeff Buckley and The Kings of Convenience as well as the Elbow/Eels/Radiohead combo. Oh and Snow Patrol of course. "If it looks like it works, and it feels like it works, then it works." LineManager is in efficient mode. We have an agenda for tomorrow's meeting. Item 6 is "Fireworks" which sounds like a prediction. Item 9 is "ANOB". Which is worrying us slightly. Oh dear. I've been under the influence of Elvis Costello for years. Twenty seven years,off and on. But mostly on. The inevitable happened at lunch time - I bought The Delivery Man (I bought some other stuff to, but that's hush hush at the moment). The best I can do is stand up and admit it "My name is Beth and I am an Elvis Costello addict". Hell, I've even got 'Goodbye Cruel World'. It got off to a slow start. 'My Aim Is True' (Alison excepted) didn't knock me off my feet, and I was a little bit frightened of "Red Shoes" at the time, but 'This Year's Model' was the first album I became genuinely obsessed with. I still love it. I love the way the beginning of 'No Action' makes the hairs on the back of my neck stand up, and the fact that it lasts 1 minute 59 seconds. I love that I still don't have a clue what it's all about, but I understand it anyway. I love that I have to make up my own words in a lot of places, but it makes sense to me. And, most of all, I love the vocal squeak in "The Beat" which announces "I don't wanna be your lover, I just wanna be your victim". The effect is unhealthy, so unhealthy! Years later, a similar effect was to be had by ad infinitum repetition of "...so you go, and you stand on your own, and you leave on your own, and you go home, and you cry and ..." you know the rest. But that's another story. Today UncorrectedPersonalityTraitColleague had the gift of chocolate bestowed upon him by a grateful punter. It was a gift which he so does not deserve and which he conspicuously failed to share with his more deserving co-workers. Didn't bother me though. After all, there's a fair chance they'll turn out to be poisoned. I, meanwhile, was required to spell 'paraphernalia'. Just because I stopped a 'gentleman of a certain age' in his tracks when he began to spell it for me with "I think I can manage that" in my best "There's no need to patronise me, I'm not illiterate" voice. He called my bluff didn't he? To be on the safe side I googled, while keeping him talking. He was suitably impressed. I'm not expecting any chocolate though. Who'd have thought that the most interseting and challenging part of my working day would be doing THIS at lunchtime? The eggshells atmosphere is still affecting the office. I found it particularly difficult to concentrate today, despite Leanne's absence. Spent two hours writing a letter and got no further than "Mrs Blah appears to be experiencing some difficulty..." Mrs Blah is not the only one. My desk is completely dust free though. Being a Friday the train is packed and there is quite a lot of alcohol being consumed. I forsake my 'normal' seat as it's a bit close to a scary looking Scottish family who are all swigging Fosters. (Well, all except the three year old). GirlWhoTalksWithHerHands' Friend sits next to me, which is comforting, and soon I'm dozing. The smell of lager is very strong. It's not unpleasant, it just makes me want some. It really is very strong. In fact I can almost taste it. I'm jolted awake just in time to see GirlWhoTalksWithHerHands' Friend neatly crushing an empty Grolsch can and tidying it away into her lunchbox... that explains it then. But she could've offered me some. UncorrectedPersonalityTraitColleague is still with us but, following issues raised by LineManager, ReceptionBoy has walked out. It's not quite as dramatic as it sounds, as he was working his notice anyway , but still. The words displacement, denial and soft target spring to mind. Some might even be appropriate. LineManager also decided that yesterday would be a good day to examine our internet use. There are Policies in place. These are not exactly clear. The result of his surprise inspection is that we are all guilty of abuse. I think we knew that anyway, but warnings were issued. We are suitably chastened and subdued. And bored. UncorrectedPersonalityTraitColleague's contract is up in a month or so. It's tricky, because on the one hand he is a charmer who is capable of displaying wit, warmth and good humour. On the other, he is a spoilt baby who has out of control, teenage sized tantrums of which we are all heartily sick. Hoping that someone will lose their job seems small minded and mean spirited in the extreme. But he is impossible to work with and LineManager appears totally unable to manage him. ThesaurusBoy has been on the point of resigning for the past couple of months and even LaidBackColleague has reached the end of his tether.Things are getting tense. Again. The roof of the train started leaking this morning. Only in one place, only two people got wet. One moved, unfussily - resigned. The other sought out the conductor and told her what was happening. Why? What possible good can come of this? She can't pop out on top & fix it can she? She can't stop it raining. Hopefully, she won't be so concerned that she informs Control and gets the train withdrawn from service...we'll all be in trouble then. Thanks pal. Oh, and Charlie & Leanne think I should sell the BDB Kinder Egg on ebay. Some people have no soul. I've never actually seen a 3-0 victory before. I'm on a roll. 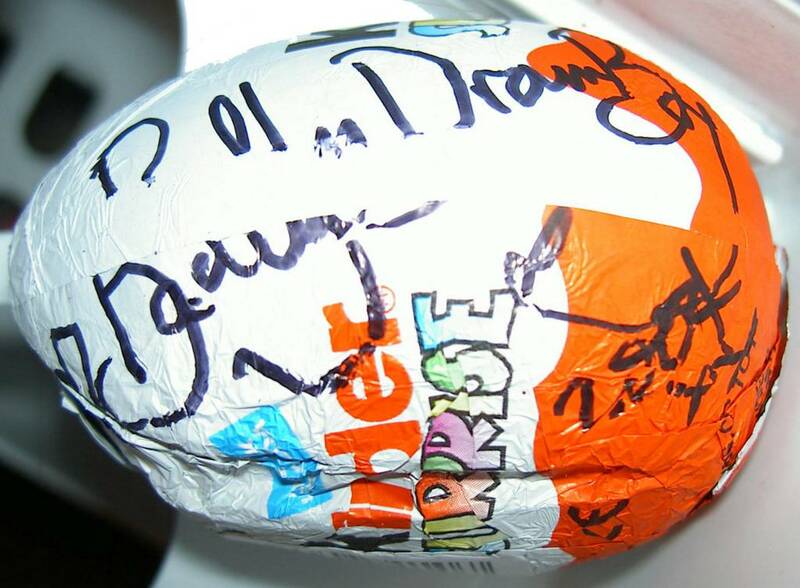 Following the Belle & Sebastian set list triumph I have had a Badly Drawn Boy autographed kinder egg victory. The support band threw it out to the 'crowd' (quite sparsley dotted around the Bridgewater Hall at that point) it flew straight towards us. Tim and a Lad in the row infront both went for the catch - there was fumbling. The egg fell to the floor. There was some scambling.I had a flash of insight and realised that if Tim got to it first he was going to give it to the Lad anyway. I put my foot on it and pulled it towards me. Tim is a LovelyPerson. I am not. It went into my pocket. Anyway, Badly Drawn Boy. Odd little chap. First half of the show - needed to loosen up. Second half - needed to tighten up. Someone got married on stage and BDB announced his retirement. But I don't think either was legally binding. Post Script: Stuart's Diary entry for the 8th September is full of the sort of detail I really want to read about the Mercurys! And sometimes my head is full of stuff. And, who's is the mystery bottle of Stella in the fridge at work? And if it's still there at 5.00pm today (or maybe sooner, if today's as hot as yesterday) it might be mine. And how come some people say "I've wiped it up" when all they've done is spread it more thinly. And what about my impulse this evening to walk up to the door of the PoshPlace that wouldn't let me in on Friday when I was wearing baseball boots, hover on the threshold for a second, turn on my heels and walk away exclaiming "Nah! don't think so". Yes, I know the Bouncers wouldn't be mortified, I know it's childish, petty, stupid even. But is it not an understandable impulse? *I know now. Shame it had to be the third best Glasgow Based Band that won. What goes on in Garden Street? TheOfficeWhereTheyParty was partying again. They have tinsel and music and hang out of the windows, but they're all wearing headsets. Is it CallCentreHeaven? For tomorrow's meeting I need my Top 20 songs for a "best songs ever" compilation CD. I know it's impossible, but it's a classic question, and not trivial at all. And I'm going out tonight, so how can I possibly narrow it down in time? I'll need to take a pen, so I can scribble hastily on the serviette when inspiration strikes. Somedays there is nothing in my head. 22 Days to go til the Holiday. Flexi Time is building up nicely. I ate the last donut this afternoon. I didn't need it. I didn't really want it. I wanted to stop UncorrectedPersonalityTraitColleague having it (he'd already had two). Are there some issues here? A man from the RSPB, who I emailed only yesterday, says there probably isn't anywhere in the North West that still keeps humming birds, so I'm not going to get to see them. According to Leanne, 'Animal World' probably has some suitable alternatives - but what's a suitable alternative to a humming bird? There just isn't one. Since the retirement of the OrganisedCommuter, GeekBoy and RelaxedMan seem to be forging a closer allegiance. The situation will need monitoring. The trick is, spotting the regular 17.17ers who are more pissed up than you are. Tonight - One only. There was a hedgehog snuffling along the gutter on my street. I didn't get close enought to check out it's whiskers, but I did re-direct it out of the road and into a garden. I hope it didn't turn round and head back out again the minute my back was turned. Luckily for me, as it pulls onto platform five just as I do. I bought a book called 'Quick Fix HTML'. Had I more money than sense I would've bought "ipod & itunes for Dummies" for UncorrectedPersonalityTraitColleague (his is still in the box) fortunately the £11.99 stayed in my purse. I'll be spending it this evening instead, on drink, with Leanne. * had to call it late breakfast in the Sun Cafe - but it was still good.